How much time do you have to commit to marketing and sales activity to be successful? Unless you’ve established ratios, you don’t know, and it’s easy to tell yourself that whatever you’re doing is good enough. What they’re saying, without consciously intending it, is, “Well, without changing anything I’m used to doing, that’s how much time is left over for BD.” BizDev is the afterthought, bolted onto an existing schedule, and subject to cancellation when any of the other commitments runs long. Extra time: After you fulfill all your professional and family responsibilities, exercise, socialize, and rest, you only have enough time to put two foundation bricks in place each week. Will that get it done? Sure, eventually, but it will be years later, long after your purpose has been negated because your car has suffered serious weather damage waiting for its shelter to be completed. Value the goal and get it done: You reallocate time you’re used to devoting to some other things in favor of building the garage now, before Winter wreaks havoc on your car. 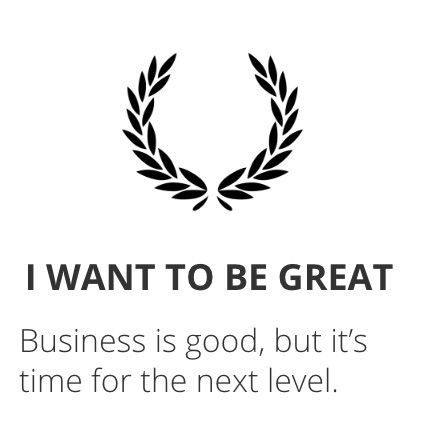 Business development is no different. If you devote two hours per week to BD, eventually you’ll have business, but unless you get very lucky it will be a long, long time in the future. More likely, you’ll get discouraged by the lack of results and give up. How much is enough? How do you determine how much time and effort you should commit to achieving your goal? You establish and monitor activity ratios. It’s a literal term, a series of ratios of activity to next-step results. How much of each step you need to enable the next step. You begin with the revenue goal, and engineer backward. Let’s say you want to add $500,000 to your book. Great. How many sales do you have to make to get $500k? That will derive from you Average Unit Sale. If you’re selling a regulatory solution that averages $100k per year, you need five sales. can organize a group of stakeholders to reach a decision. What does it take to get 20 qualified Prospects? How many Suspects must you interview and qualify? A suspect is someone whose membership in a group, such as a segment of an industry, causes us to suspect that they likely face our demand-generating problem. This is going to be a higher ratio than the Prospect:Sale ratio. Current data suggests that the traditional Sales Funnel has been replaced by the Buyer Journey, and that 70% of that journey occurs privately, online, before they’re willing to reveal themselves to a seller and confirm what we suspected about their situation and need for a solution. We get exposed to them through our thought leadership, i.e., our writing, blogging, speaking, social media posts, etc., that form “idea relationships” over time. This is what enables buyers to conclude that your ideas make sense to them, align with their own thinking, and constitute a reason to trust you enough to reveal themselves to you for consultation. This will be a much, much larger number than in the Suspect:Prospect ratio. How many people must be exposed to your thinking about a specific problem, over time, to produce this trust? We know that a single exposure isn’t likely to produce the level of familiarity and trust it takes for someone to invite sales activity. How often must they be exposed to your thinking? Recent studies suggest that it takes a dozen “touches” to make a sale. Since we’re only talking about part of that process, let’s say you’ll need half that. Right now, you don’t know what these ratios are because you’ve never measured them. That’s OK. We have start somewhere, so begin with whatever data you have, augmented by your gut feel. Sounds pretty sloppy, doesn’t it? That’s OK, too. This is just a starting point. As you go along, you measure the actual results, and adjust your ratios to that. You think that only one in five Suspects will qualify as Prospects. So, to get those 20 prospects, you’ll have to qualify 100 Suspects. How much exposure to your ideas will it take to get those? You wet your finger, stick it into the air, and guess 5000 exposures to attract one Suspect, which is the product of reach (number of people) times frequency (how often they’re exposed to you) to produce one Suspect. To net 100 Suspects, you need 500,000 exposures. Wow. A half-million exposures feels daunting, right? Maybe not, if your communication channels reach a large enough audience, and the problem you’re talking about is compelling enough to capture their attention. 48 of the 50 largest groups have at least 100,000 members. There are hundreds more with five-figure membership. Recent studies show that half of LinkedIn users log in monthly, and 40% of those active users log in daily. That means that 20% of all LinkedIn users visit daily. Let’s say you join 20 LinkedIn groups whose members logically would have a stake in your demand-triggering problem, and those groups have an aggregate membership of 300,000. Using the statistics above, if you post something relevant and useful every other week, 120,000 relevant people might be exposed to your thinking each month. (300,000 x 50% active x 40% daily x 2 posts per month) You might achieve your 500,000 exposures in about four months. How much faster would you get there if you posted weekly? Or joined more groups? Or both? As you track and measure your progress, these ratios may very well prove to be completely wrong, either high or low. You can see that just researching, writing, and posting something relevant and useful to LinkedIn groups might easily take a 2-3 hours each week. And that’s just one lead-generation strategy. It doesn’t include time spent on other exposure-creating tactics such as blogging or writing articles. Or earning, preparing for, delivering, and following up on public presentations. Or email marketing. Or other social media. The point is, if you claim to be serious about generating meaningful new business, you’ll need to know if you’re doing enough to get where you want to go. Establishing activity ratios allows you to isolate your attention to creating Exposure, which is completely within your control. 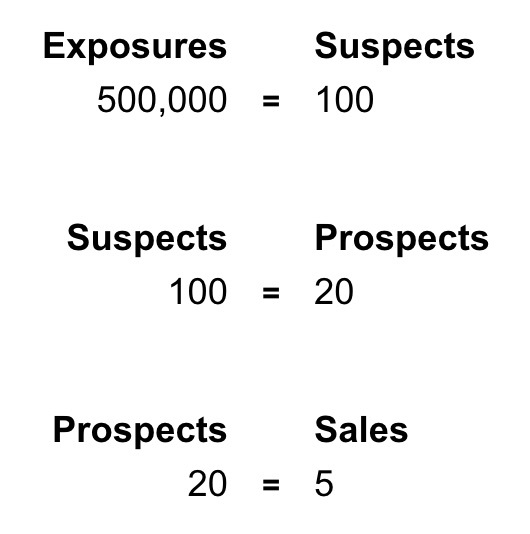 There is a ratio of Exposure to Suspects, Suspects to Prospects, and Prospects to Sales. We just don’t know what it is yet. But if you begin with your best guess and measure outcomes, your accuracy will improve over time. Your bottom line is that in a competitive Buyer’s Market, the Seller’s Market BD time commitment of a couple of hours per week won’t get it done. Ratios will help you discover how much more it will take. Then, you have a decision to make. Will you reduce your goal, or increase your effort and time investment? Those are the only two responses available.